In a new study published today in the Journal of Health Psychology, researchers from the University of Surrey have found dieters who eat ‘on the go’ may increase their food intake later in the day which could lead to weight gain and obesity. The findings from the study also showed that eating while walking around triggered more overeating compared to eating during other forms of distraction such as watching TV or having a conversation with a friend. The team examined 60 females who were either dieters or non-dieters and gave them all a cereal bar to eat under three different conditions. The first group was asked to watch a five-minute clip of the sitcom ‘Friends’ while eating. The second group was asked to walk around the corridor while consuming the cereal bar, and the third group was simply asked to sit opposite a friend and have a conversation. After the experiment, participants completed a follow-up questionnaire and a taste test involving four different bowls of snacks, including chocolate, carrot sticks, grapes and crisps. How much they ate was measured after they left the room. The results showed that dieters ate more snacks at the taste test if they had eaten the initial cereal bar whilst walking around and specifically they ate five times more chocolate. 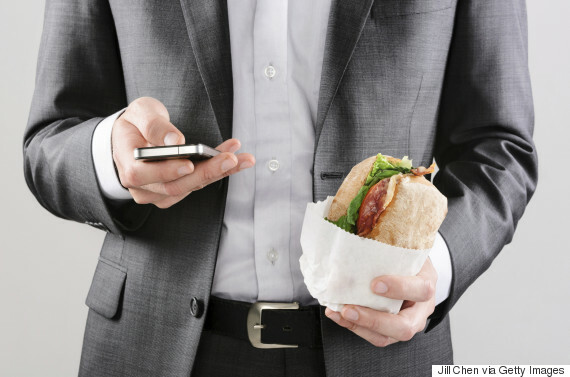 “Eating on the go may make dieters overeat later on in the day,” said lead author Professor Jane Ogden from the University of Surrey.